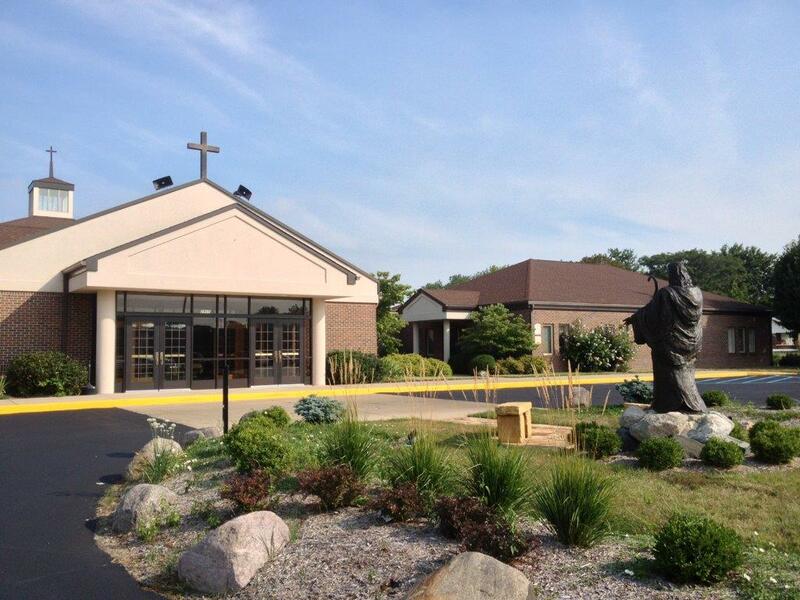 Good Shepherd Catholic Church 2905 Carson Ave.
Congratulations and best wishes on your forthcoming marriage! We also want to thank you for considering Good Shepherd as the church where you will bestow the beautiful Sacrament of Marriage upon each other. We are indeed honored! Planning your wedding day and celebrating your marriage as the public beginning of a lifelong covenant between yourselves and God should be a time of grace and spiritual and emotional growth. That is why the Church requires all couples planning to get married to begin that process at least six months prior to an anticipated wedding date. My task, as the person primarily responsible for preparing you for the Sacrament of Marriage, is to help you not just have a beautiful wedding, but more importantly have a beautiful life together with Our Lord as a constant companion on that journey. Again, congratulations, and please feel free to call me at any time if you need assistance in your plans. May God bless you during this special time of preparation! WEDDINGS AND MARRIAGES: WHAT’S THE DIFFERENCE? A wedding is a ceremony that begins when a man asks a woman to become his wife, and concludes with a Mass or Wedding Service on the day of marriage. It includes, but is not limited to, all of the activities that surround the covenant into which the man and woman will enter. Selecting wedding rings, choosing a wedding gown, arranging for a wedding cake, registering for gifts, renting a reception hall – these are all part of the wedding. There is a growing concern among the clergy that Catholic weddings are falling victim to the intense consumerism of our day and there is evidence to suggest some couples have very little interest in the spiritual dimension of their wedding day at all. Good Shepherd Parish is making every effort to ensure couples being prepared for marriage receive the very best preparation for their future life together. In the Sacrament of Matrimony (marriage), a man and woman establish a lifelong covenant which, by its very nature, is ordered to the well-being of each other and an openness to the procreation and upbringing of children. Many life-long Catholics are surprised to learn that the sacrament of marriage is the only sacrament that is not bestowed by a priest. In a Catholic marriage, the couple bestows the sacrament on each other, and the priest stands as the Church’s official witness to the sanctity of that moment. In the Catholic Church, sacraments are to be celebrated as religious ceremonies that signify the grace of Christ poured out upon God’s people through the ministry of the Church. All sacraments require serious preparation and dignified ceremony. That is why in each local diocese, the bishop has the responsibility of setting forth policies concerning sacramental preparation and ceremony. A basic presumption is that the policies of the Archdiocese and Good Shepherd parish, as outlined in this booklet, will be fully respected and followed.  At least one of the persons planning marriage must be a member of Good Shepherd, or a son or daughter of a presently registered Good Shepherd family.  If the Catholic party lives within the boundaries of Good Shepherd, but is not a registered member, he or she must register before beginning the preparation process. Registration is not merely the formality of having one’s name listed on the parish roster; it always assumes active participation which includes financially supporting the upkeep of the parish.  Immediately upon contacting the Parish Priest about the possibility of being married at Good Shepherd, the prospective bride or groom will receive a copy of this booklet. Once the couple has read the booklet and gathered all of the documents required for the first meeting, they should call for an initial appointment with the Parish Life Coordinator. The earliest date for a wedding would be six months from the date of this first meeting. The proposed wedding date must be confirmed by the priest who will preside at the ceremony before it can be reserved on the parish calendar. 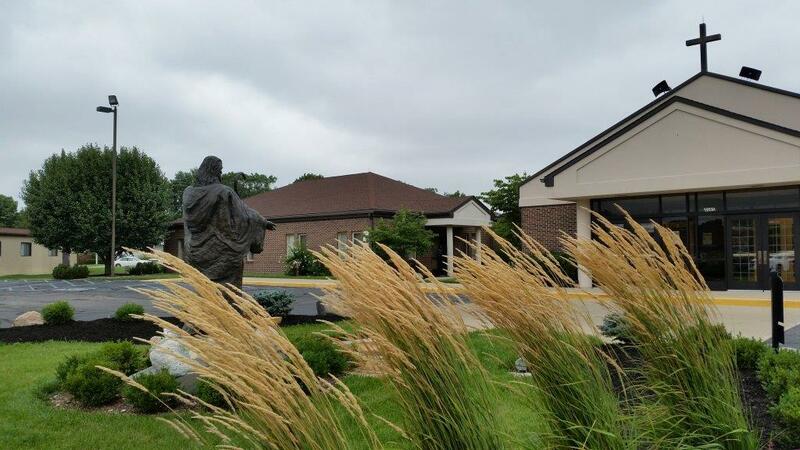  First is a “Tobit Weekend” which is conducted by trained married couples from throughout the Indianapolis area and is held at Fatima Retreat House. This is an excellent program and a brochure providing additional information will be provided.  Second is the “Pre-Cana Program” offered by the Archdiocese. This is a Sunday afternoon meeting of only a few hours and is conducted by a priest, a married couple, and one or two other volunteers. While this program does fulfill the minimal requirements, it is obviously more limited in scope and opportunity than the other two options. Considering the degree of importance the Church attaches to Sacramental preparation, this option should only be considered if it is absolutely impossible to participate in the Tobit or Marriage In the Lord programs. Here at Good Shepherd, a premarital personal and relationship evaluation tool called the “Prepare Inventory” is used. The Prepare Inventory is not a test and there are no “right” or “wrong” answers. It is a set of 165 questions designed to help couples learn more about themselves, their partners and their relationship. Scored professionally, it can identify some of the strengths in your relationship and problematic issues for you to discuss with your partner. Upon return of the scored Inventory, an appointment will be set with the Parish Life Coordinator to discuss the results. The materials and scoring of this Inventory is included in your Marriage Preparation Registration Fee.  Meeting #1 offers the couple an opportunity to fill out the required Archdiocesan forms and present proof that they are free to marry. Proof of freedom to marry is required by the Catholic Church in all ceremonies in all parishes. By this it is meant both parties must prove they have not been married before. If either party has been previously married, it must be proven the party is now free to marry because the previous spouse has died, or a declaration of nullity has been granted by the Catholic Church.  Meeting #2 will provide an opportunity to complete the Prepare Inventory.  Meeting #4 is the time when the couple will meet with the Parish Priest or officiating priest to complete the Parish Rehearsal Form which is based on the planning form found in the back of the “Together For Life” booklet. During this meeting such items as altar decorations, unity candles, expectations surrounding the ceremony (e.g. no throwing of rice, bird seed, etc.) will be discussed. It should also be noted that five bridesmaids and groomsmen, including maid of honor and best man, seems to be a nice size wedding party and does not overwhelm the sanctuary area. Please consider this as you plan the wedding. Any questions concerning these requirements should be directed to the Parish Priest at 783-3158. The Catholic Church rejoices that couples choose to be married in a Catholic ceremony because such a choice implies the same type of belonging and commitment that is necessary in marriage. It is not unusual that some couples are a little uneasy about approaching a priest concerning marriage when they have not been actively practicing their Faith. In such a situation, the Church will expect the engaged parties to attend Mass and ask the Lord to be a part of their months of preparation. If a couple can make such a commitment during marriage preparation, it will certainly invite God’s blessings upon their marriage. Should they not be able to make or keep such a commitment, it will call into question whether or not they have between them the ability to live out the life-long commitment required in marriage. 1. I reaffirm my faith in Jesus Christ and with God’s help intend to continue living that faith in the Catholic Church. 2. I promise to do all in my power to share the faith I have received with our children by having them baptized and reared as Catholics. All permissions, dispensations, etc. will be taken care of at an early meeting with the Sacramental Minister. Both the bride and groom should bring recent copies of their baptismal records to the meeting. The non-Catholic should be able to provide some sort of proof of baptism. When an engaged couple has a priest either in the family or as a close friend, it is a special blessing for them. If that priest is available to marry them, it is usually a miracle! If you have such a priest as a friend or family member, he is certainly welcome to celebrate your marriage. Such a situation does require the visiting priest receive special permission (called “delegation”) for the marriage to be valid, but that can be easily arranged by the Sacramental Minister for any priest in good standing with the Catholic Church. Please provide the name, address, and phone number of the priest no later than the second meeting. In the State of Indiana no special certification is required of a visiting priest to assist at a marriage, but it will be necessary for the Sacramental Minister to talk with the visiting priest at least once prior to the wedding; and it will be assumed the visiting priest will be present to direct the rehearsal. WHO ARRANGES FOR THE MUSIC? Arrangements with an organist and/or vocalist are made separately from the church and the musicians are paid separately. Contact them for their fee schedule. If the wedding is to be a Mass, then either the organist or soloist must be Catholic. Weddings can be held on Friday evenings with starting times between 6:00p.m. and 8:00 p.m. or on Saturdays between 11:00 a.m. and 1:30 p.m. (the latest starting time on Saturday). Weddings may be scheduled on Saturday evening after 6:30p.m. Please remember there is an Art and Environment ministry at Good Shepherd whose members work throughout the year to create a worship space which reflects the various liturgical seasons. 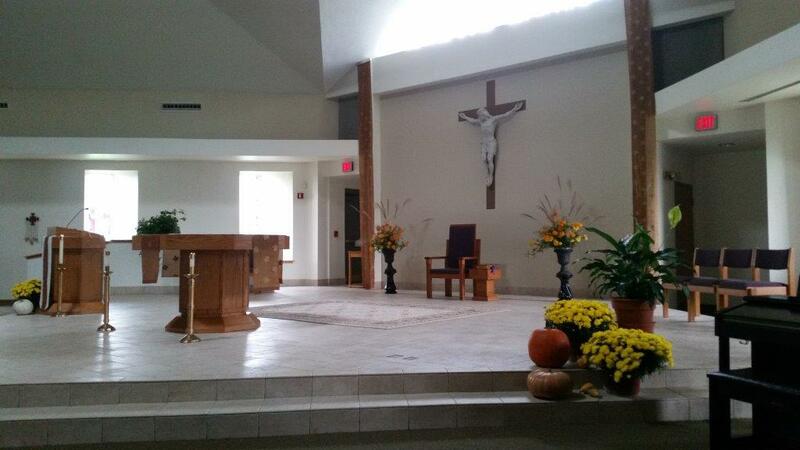 Most of the time, these decorations can be removed for weddings and placed back in the church for the weekend Mass. No decorations, however, may be moved during the Christmas season (three weeks after Christmas) or Easter season (fifty days after Easter). No tape, tacks, or wire may be used in securing bows and/or flowers to the church pews or chairs. Usually a florist will be able to secure them without these objects. Please make the florist aware of this rule. Due to the centrality of our baptismal font, use of aisle runners may be in question. Check with the pastor. 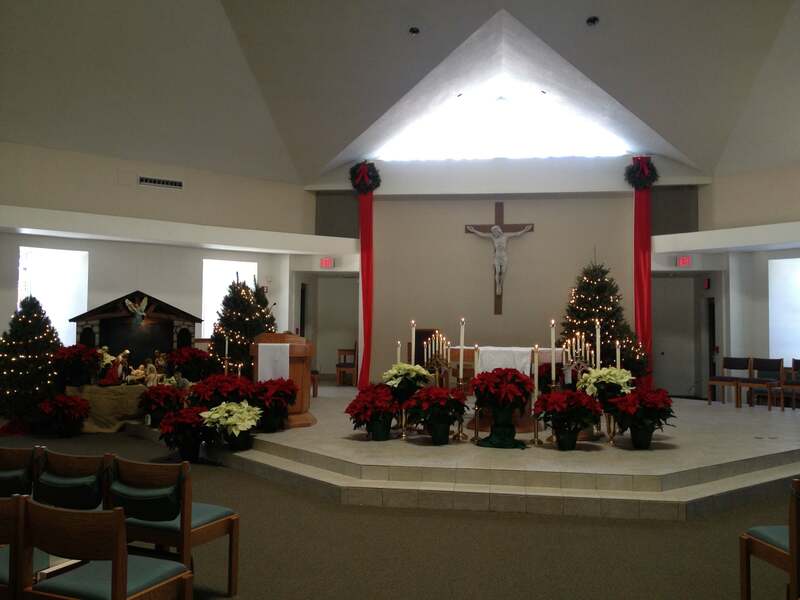 Good Shepherd Parish has two candelabra. These can be used at any wedding. If new candles are desired, there will be a charge of $50. These candelabra can be placed on stands in the back area of the sanctuary. They may not be placed on the altar. Pictures may be taken before or after the wedding. If taken after the wedding, the church must be vacated by 3:30 p.m. on Saturdays. There should be no flash photography during the wedding ceremony. Photographers are not allowed in the sanctuary area during the wedding. Videotaping of weddings is permitted. The videographer should be stationary throughout the wedding and should consult with the priest or Parish Life Coordinator regarding the best location. WHO NEEDS TO BE AT THE REHEARSAL? The final planning meeting is the wedding rehearsal. The date and time for the rehearsal will be finalized when the wedding date is finalized. The wedding rehearsal takes place in the church and usually lasts one hour. Everyone having a part in the ceremony should be on time for the rehearsal. This would include the bride, groom, parents of the bride and groom, best man, maid/matron of honor, bridesmaids, groomsmen, ushers, readers, ring bearers, and flower girls (if used), and outside musicians. Parish musicians usually do not need to attend rehearsals. The bride and groom should bring to the rehearsal the unity candle (if used) and a souvenir program (if one is printed). There is a “bride’s room” off the narthex where the bride can leave her dress overnight if she wishes, or others could leave things. Good Shepherd was dedicated in November of 1996 and provides both a beautiful and intimate setting for all worship services. The church is completely handicapped accessible. Special attention was given to providing a workable setting for the celebration of weddings by providing a “bride’s room” for the bride and her attendants. While the groom and groomsmen usually come already dressed, there is ample space for them in a side meeting room should it be needed. The church building is a holy place and should always be entered into with joy and reverence. Proper attire is expected, even at rehearsals. The church holds 250 people not counting the two side “overflow” areas which can hold up to an additional 150 persons should it be needed. No smoking is allowed in the building and gum chewing is not permitted in church. Also no alcohol may be consumed on church property before or during either the rehearsal or wedding. Please make all members of your wedding party aware of these rules prior to the rehearsal. A fee of $300.00 is required of any active parishioner preparing for marriage at Good Shepherd. This fee covers the materials and professional scoring of the Prepare Inventory, the Marriage Preparation booklet, all required paperwork, and costs associated with operation of the church facility. It should be noted that this fee does not cover any part of the Archdiocese Pre-Cana or Tobit Weekend, which would involve a separate charge as outlined in their brochure. Non-members of the parish, or registered members who have not been active or contributed financially to the upkeep of the church through regular Sunday collections, will be charged $500.00 for use of the church. This fee must be paid at the time the church is reserved for the wedding. It has been customary in the Catholic Church to offer a “stole fee” to the priest who presides at the celebration of a marriage. At Good Shepherd it has been determined an approximate stole fee of $100.00 is a respectable offering for weddings. If altar servers are used, it is customary to give each of them a small stipend of $15.00. The wedding is over and the marriage begins! To assist couples in their adjustment to married life, follow-up contacts with the Priest or mentor couples are encouraged on a quarterly basis for at least the first year. Because current statistics indicate most divorces occur in marriages of five years or less, with the third year being the most critical, these follow-up contacts will assist in helping to identify some of the potentially problematic issues that confront couples in the early years of marriage. It will be the responsibility of the couple to arrange the first follow-up meeting with the Priest within a reasonable length of time after the wedding.